What is Cancer State Aid? 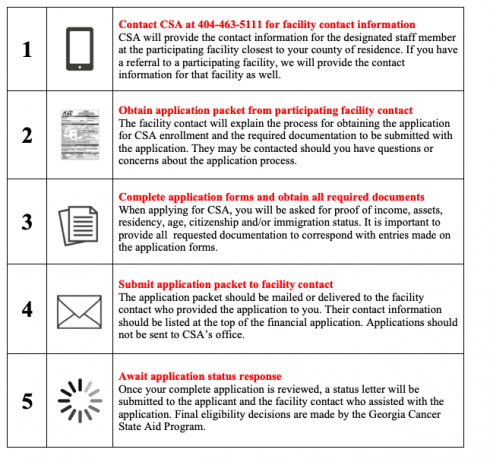 The Cancer State Aid (CSA) Program was established in 1937 by the Georgia legislature at the request of Georgia physicians to reduce the burden and cost of cancer care for uninsured, under-insured, and low-income patients. For over 80 years, CSA has funded access to services for eligible patients diagnosed with cancer or conditions highly suspicious for cancer. CSA receives state funding to support access to screening, diagnostic, treatment planning, and cancer treatment services provided by participating hospitals, freestanding radiation therapy centers and participating medical office practices. Other services, such as related prescriptions and medical supplies, may be available through participating independent pharmacies, home health agencies and medical suppliers. CSA applicants must qualify both financially and medically to be approved for enrollment and funding. Patients must make application through a participating Cancer State Aid (CSA) hospital or freestanding radiation center. Designated staff at these facilities assist with the application completion process and submit the completed application packet and corresponding documentation to CSA on the applicant’s behalf. Contact the Cancer State Aid Program at 404-463-5111 for additional information.